The photo above shows a moonrise sequence above an oil tanker in Casco Bay, Maine, as observed on September 18, 2013. 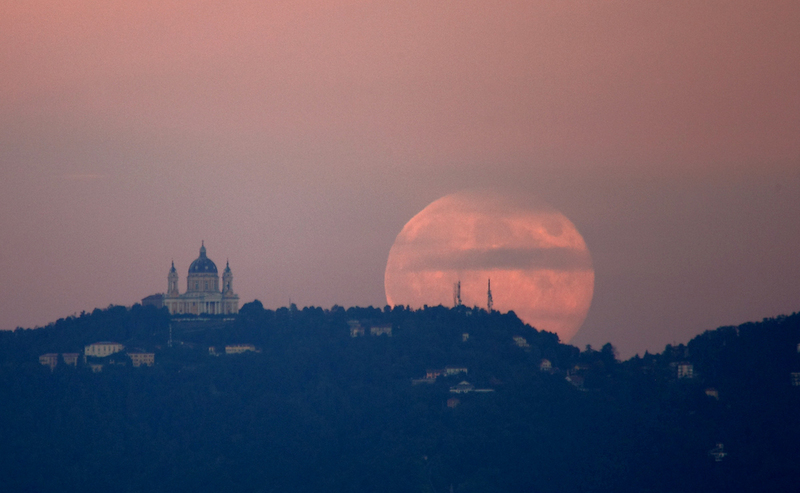 The Moon was one day shy of being a full Harvest Moon. Initially, only a faint outline of the lunar disk can be observed since the Moon is rising through a dense layer of haze. When the Moon (or Sun) is close to the horizon the increase of path length acts to redden the moonlight that reaches our eyes. However, if enough haze particles or other aerosols are available the moonlight may be completely extinguished. On this evening the Moon was invisible until it was approximately 10 degrees above the horizon. Note that the Moon is moving through the Belt of Venus (or anti-twilight arch) -- the pink band of scattered sunlight that sits atop the rising Earth's shadow. Photo details: Camera Maker: NIKON; Camera Model: COOLPIX P510; Focal Length: 40.1mm (35mm equivalent: 225mm); Aperture: f/4.6; Exposure Time: 0.0050 s (1/200); ISO equiv: 110; Software: Adobe Photoshop CS4 Macintosh.